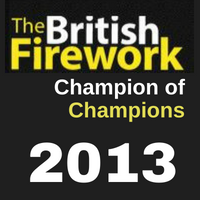 Star Fireworks prides itself on the quality of our fireworks. Every year Andy and Sean travel the world to source the best suppliers and the highest quality. Although the flashes and bangs are taken for granted there is quite a lot of Science in the manufacturing of fireworks. The burst pattern, the colours and sound is the result of careful design and arcane knowledge. Fireworks can be divided into high-level, medium-level and ground-level fireworks. On visiting your location and discussing the size of your audience Andy and Sean will determine which type of fireworks are most appropriate for your display. Often for small audiences with a clear view, mid-level fireworks make sense. Ground-level fireworks are wonderful when teamed with special effects for venues that require quiet fireworks. Many wedding venues fall into this category. For larger public shows in urban areas, we may choose to fire from a barge or structure. The result is dramatic high-level fireworks, clearly visible to thousands of viewers. We have assembled a selection of videos to give you a taste of the fireworks you might see in our shows. A great shell that fills the sky with a glittering array of sparks. Looking like a Palm shell initially the individual stars then split in 4 creating the classic ‘Crossette’ effect. Stunning on its own, but sent up as part of a volley of shells this effect can fill a sky with its breathtaking effect. The brocade crown is perhaps the most impressive of display shells with each of the numerous stars contained within leaving a trail of fine glittering sparkle as it flies outward. The red pistil refers to the coloured center that can be seen as the shell bursts, glittering red in this instance it can be one of many colours and is definitely one to look out for….especially in the big finales!! Similar to the Crackling Willow in its overall appearance these shells fall silently without the audible effect. Before fading away though each star turns a vibrant red giving the effect an unexpected dimension filling the sky with both ‘hanging’ sparks and a wave of colour. Look out for these shells ending in a range of colours through to strobe effects before they fade away. These always provoke appreciation from the crowd. Guaranteed to bring a smile to every face there is an art to drawing with fireworks. Heart shaped shells are favorites at weddings and engagement parties. What better way to say, "I love you." Simple logos are sure to impress at corporate events.